Fullscreen Window Set your app window to the full-screen native resolution of the display. 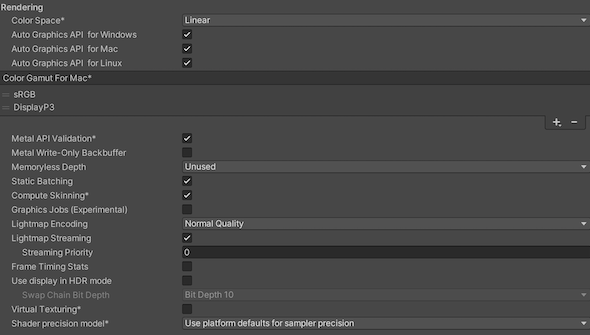 Unity renders app content at the resolution set by script (or by user selection when the built application launches), but scales it to fill the window. 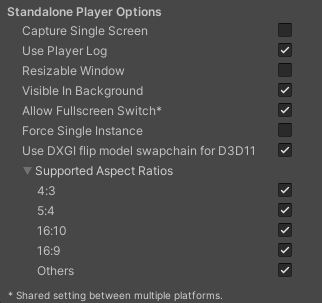 When scaling, Unity adds black bars to the rendered output to match the aspect ratioThe relationship of an image’s proportional dimensions, such as its width and height. See in Glossary chosen in the Player settings, so that the content isn’t stretched. This process is called letterboxing. See in Glossary. This option is only available if the Fullscreen Mode is set to Windowed. See in Glossary Choose the scripting backend you want to use. The scripting backend determines how Unity compiles and executes C# code in your Project. Input System (Preview) Use the newer Input system. The Input System is provided as a preview packageA preview package is in development and not yet ready for production. A package in preview might be at any stage of development, from the initial stages to near completion. See in Glossary (ScriptOnly) , all the time (Full), or never (None). Virtual Reality Supported Enable native VR support for the Unity Editor and your game builds.